How to Write a Response Paper Easy: Great Tips and Advice! Usually, when creating a personal essay or paper, the writer is expected to review a particular article, read a given book, or watch and evaluate a movie. They will then be asked by their professor to respond to this article, book, or movie. In most cases, the rules that apply to response paper writing are different to those that pertain to other types of writing. Response papers are sometimes referred to as reaction pieces. These are considerably different from the more formal types of movie and book reviews. The use of first person pronouns is permitted. The writer is free to write about themselves and how they feel about the topic they are discussing or describing. If your writing skills are quite advanced and/or you are a model student, it is possible you will have difficulty using such phrases as “I think” or “I feel” when writing an academic text. But since this is a chance to excel, you should try. Begin by formally analyzing the article, book, or movie you are evaluating. After this, you can add your own impressions with a view to sharing these with people reading your paper. 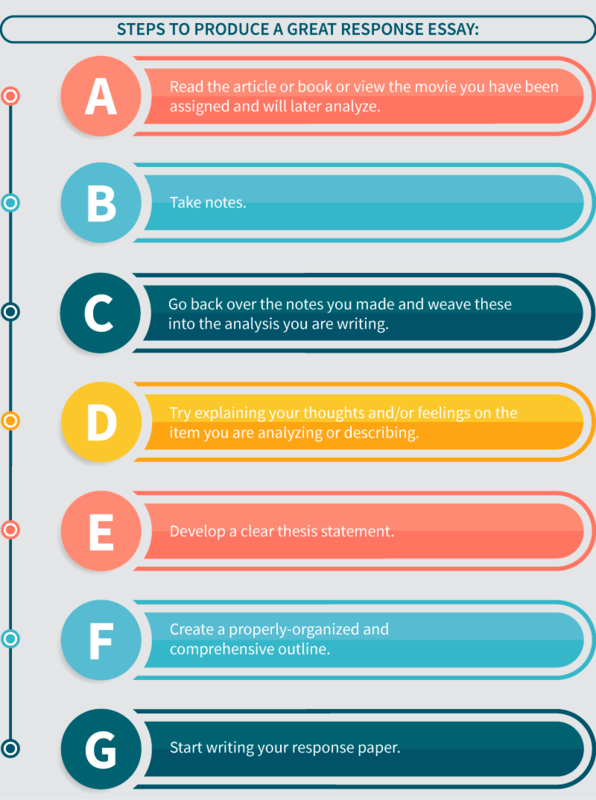 The following steps are designed to help you produce a great response essay. When your outline is ready, you can begin writing your paper. You should start with an introductory paragraph, which needs to be sufficiently strong and convincing to persuade readers your work is well worth reading to the end. The opening paragraph of a reaction paper needs to show the title of the article, book, or movie being reviewed. The thesis statement should make up the final sentence of this paragraph, and this should incorporate the main idea or point of the paper and outline its topic and theme. Your analysis or description need not be limited to impressions, thoughts and/or opinions. You may describe your thoughts and feelings about an article, book, or movie. In fact, this is the main component of such a work. Should you wish to check out any samples of response papers, you may notice how creatively and skillfully the writer sets out their opinion and describes their paper’s focus. Be sure to check all spelling and grammar before you submit your paper to be graded! Think of your response paper as a way of compiling two elements i.e. an objectively-reasoned analysis and a subjective-type response. When the subject of your review is a movie, it always helps to look online for examples of movie or film reviews. Think of yourself as an experienced critique and that your readers need to know if a movie is worth watching or a book is worth reading. Your review should be restrained and accurate. Any opinions you offer should be supported with reliable evidence.